Last week I got my reel back from Badger Reel Repair. 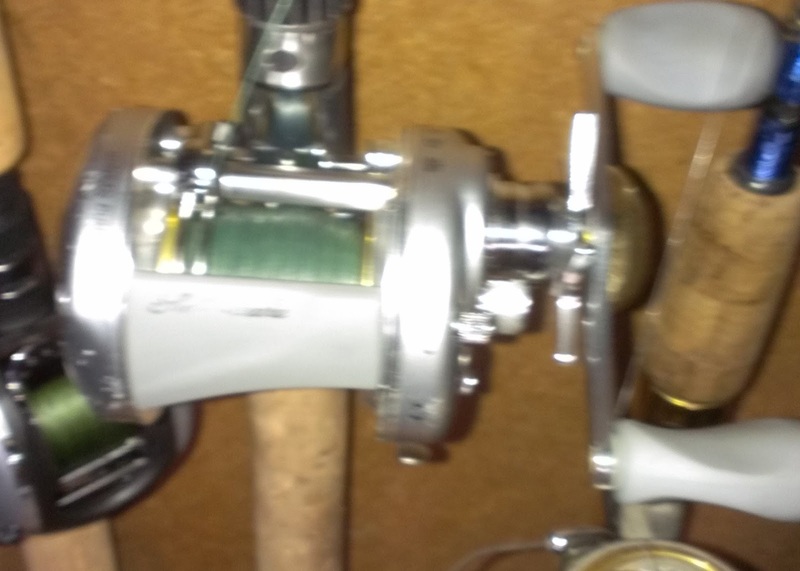 The reel (pictured above) was given to me by my brother Rob the last time I saw him, before he passed away in Aug. 2011. It was the second time I've had it in for repairs. The first time it didn't seem to be working right, so I brought it to BRR and it cost me $25 to clean, oil and repair it. When I tried it again this summer, it still did not seem to be working right. Now, normally, I probably would not have spent any more money on repairing the reel. The reel only cost Rob $75 at the time, so putting much more into it would seem frivolous. Because the reel means more to me than just an average reel, I thought I'd go ahead and get it fixed. It was $15 to repair, which seemed like a deal to get a functional keepsake. The whole process got me to thinking about things that mean something. You know the items. Things that you would want to take to the basement with you in the case of a tornado. Things given to you by loved ones, or maybe that mean something to you from your childhood. Most everybody has them. Because of the memories attached to fishing with my brother, this reel, and the rod and lures that he gave me along with it, will always mean something to me when I use them. The items take on an identity of their own of sorts, and you treat them with a degree of respect. None of this is to say that I'm a materialistic person, because I don't think I am. There are a few things though, that everyone considers special or sacred, and I don't think there's anything wrong with that. I have a friend whose brother gave him his golf clubs before he passed away. Same deal. Every time he uses them, he thinks of his brother. Another item that means something to me is my step-father's baseball, (pictured below). It was given to me at his funeral by his natural son, Kevin. 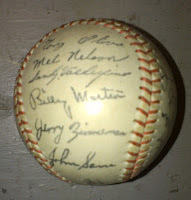 The ball was signed by many of the old Minnesota Twins, including Harmon Killebrew, Billy Martin, and Tony Oliva. In this case however, the intrinsic value behind the ball is more tied to the fact that Kevin thought enough of me to single me out and get it to me. I remember he said that Dad and I always seemed to be the closest of his step kids, and as a result, Kevin thought I should have it. Bear in mind that it's not because my step father and I ever watched a baseball game together, because we didn't. (Though we watched many a Viking game.) The thought on Kevin's part was strictly sentimental and I can certainly appreciate that. As I said, it meant a lot. There are other smaller, significant items as well. My grandfather had a watch that was given to him for his years of service where he worked. It got passed between the boys for a few years, with each of us wearing it for a year before passing it on to the next brother. The tradition died after the first round and I think my oldest brother has it now. From my grandmother, I managed to get a book of "Great plays in baseball." She usually took Rob, Paul and I to one Twins game a year, so baseball meant something to me. When I saw the book on her shelf, I asked my mom if I could have it and of course she said I could. It makes me wonder what of my possessions my kids would look at as precious when I kick the bucket. I would hope each of them would get one of my two Bible(s). And I would think my fishing stuff might mean something to one or both. Perhaps my laptop, as it's the source of one of my favorite past times, namely writing. The rest of it, like so much of everyone's past gets parsed out to the 2 G's; goodwill and garage sales. So when you're thinking of what you want or need this Christmas, give some thought to the things in your life that have significance for you. What could you do without? What would you grab if a flood was imminent? My guess is it won't be anything on this year's list.